If you've wondered what the convoy of vehicles parked outside your local movie cinema was in aid of lately, it was probably Cars 2. 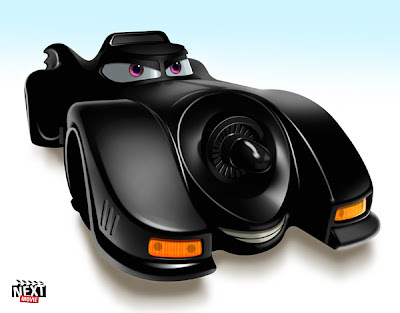 Pixar's popcorn-friendly sequel has revved engines across the globe, and inspired NextMovie.com to suggest a few famous cars that could guest-star, should the hit-animation house zoom ahead and make Cars 3. If this wasn't the sleekest, coolest Bat-set-of-wheels ever, I'll kick a penguin. With Marvel now a part of the extended Pixar family, showcasing their opposition's best known form of transport may little more than an exhaust-pipe dream, but it sure is fun. To see the other six fantasy car nominees, click the jump. I'll show this to my children. they'll be trilled. They should be Aliera - I was - but then again I'm just a big kid - just look at this blog!